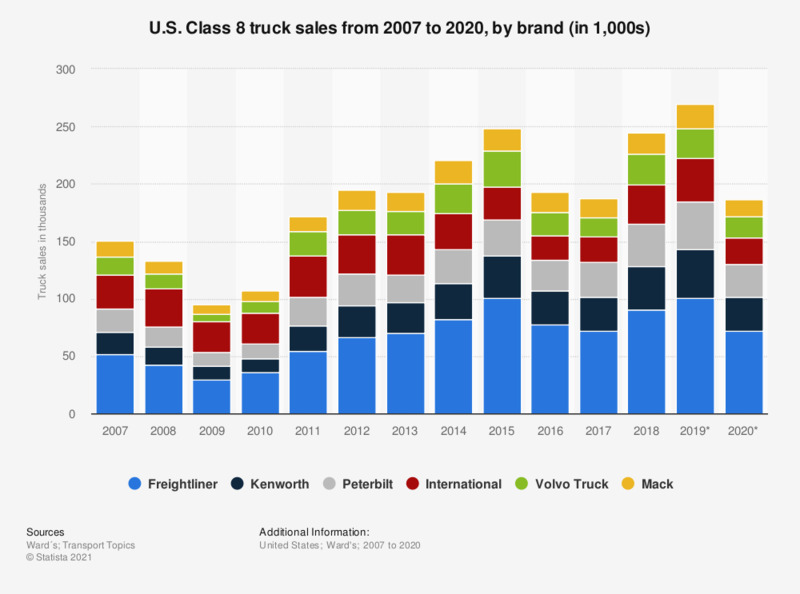 This statistic represents U.S. Class 8 truck sales between 2007 and 2018, by brand. In 2018, Daimler's Freightliner division sold more than 90,860 Class 8 trucks. With a 36 percent U.S. Class 8 truck market share, Freightliner is also the market leader in the United States. The Class 8 truck gross vehicle weight rating is anything above 33,000 pounds. The Class 8 truck gross vehicle weight rating is anything above 33,000 pounds. The figures for 2007 to 2011 are taken from a previous edition of the report. The figures for 2007 through 2016 were taken from 2016 Vehicle Technologies Market Report (figure 98), released by the Oak Ridge National Laboratory in 2017.